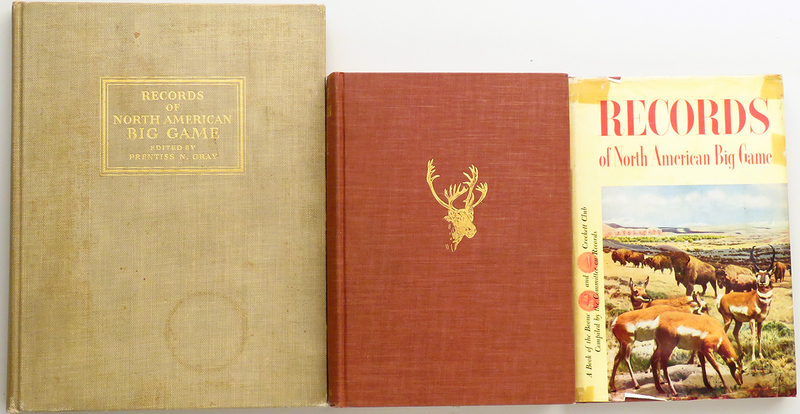 Boone and Crockett Club Records of North American Big Game, complete set 1932 - 2011, 14 books, inscriptions, great condition - Sportsman's Legacy, Fine firearms, related books and sporting collectibles. Representing estates, collectors and nonprofit conservation organizations. 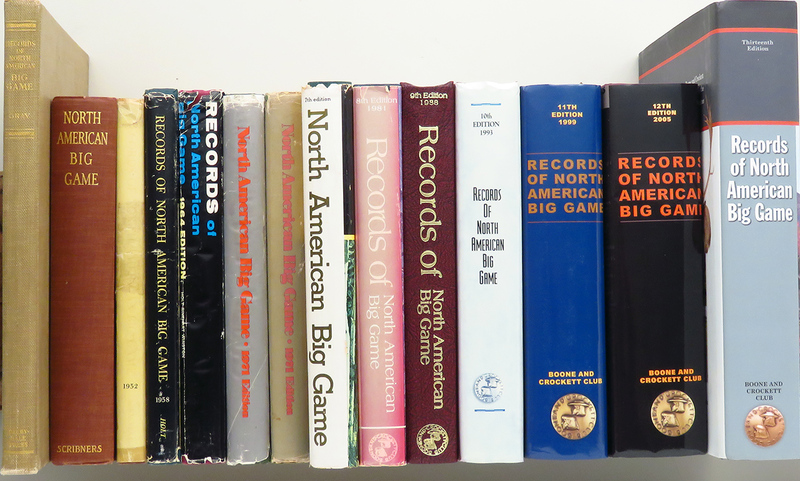 A complete set of the Boone and Crockett Club’s Records of North American Big Game comprised of 14 books spanning 1932 to 2011. This is an all-inclusive set covering the first 13 awards periods (the 1973 reprint of the 1971 book is not counted). 1932 – one of only 500 copies were printed by the famed Derrydale Press. This book has wonderful gift inscription “Oliver Wolcott from S.A.W. – Christmas 1932”. (Wolcott became a Club Member in about 1920.) The front cover has some staining and a glass ring toward the bottom, with the balance being very good. A small sticker has been removed from the inside. The binding solid, with a minor crease in the binding on the spine. 1939 – Exceptional cover, spine and exterior. The paper (not the binding itself) is cracked on inside front and a bookplate has been attached to first inside page. Exceptional interior page condition. 1952 – Exceptional cover, spine and exterior. The DJ is present and fair, but chipped and taped (mostly inside). A gift inscription on title page reads “To Maria, with all our best wishes, December 25, 1956” and signed by both Grancel Fitz and Betty Sample Fitz. (Grancel was the father of the modern trophy measuring system and coined the phrase “Grand Slam” as it relates to sheep hunting, and was the first to take all species of North American Big Game. Betty was heavily involved in production of Club books through the years). The following page has a bookplate of “Maria Folino Weld” with a slight wrinkling from application. The interior is very good, with a small area of folding/tearing to the top of pages 130-146 at the gutter. An old dealer sticker appears inside the back cover. 1958 – Fine cover, spine and exterior. The DJ is present but torn and chipped, and a significant portion of the cover missing. It is a stated first edition. Interior pages are all excellent. 1964 – Fine cover, spine and exterior. The DJ good, with chips. A dealer’s pencil notation appears on the title page. An inked inscription appears above dedication “With very best wishes, Samuel B. Webb” (Webb was a Member). This is a stated first edition. The interior is excellent, with a pencil mark running along the upper edge. 1971 – Good cover, spine and exterior. The spine is slightly listing (as is common to this printing). The interior is excellent and the DJ fair and chipped. 1973 (1971 Revised Edition) – Very good cover, spine and exterior. The DJ is good with some taping. The interior is excellent. An old dealer sticker appears inside back cover. 1977 – Fine cover, spine and exterior. The DJ is fair, with some bulging. Previous owner’s inscription is written inside the front cover. The interior is excellent. 1981 – Fine cover, spine and exterior. The DJ is good, with some chips and tears. The interior is excellent.1988 – Excellent exterior with light corner bumps. Excellent interior. 1993 – Overall excellent, with excellent DJ. 1999 – Overall exceptional. Appears unopened. 2005 – Overall exceptional. Appears unopened. Includes the bonus CD as originally provided. 2011 – Overall exceptional. Appears unopened. The price is firm and layaway is available. Proceeds benefit the Wild Sheep Foundation. $4,500 plus shipping.